As the first mass-market electric car to be sold by a major manufacturer, the original Nissan Leaf was a landmark vehicle. And it only gets better with its 2018 redesign. As proved by the hugely successful Toyota Prius vs. other hybrid competitors of the time, buyers of electrified vehicles tend to lean toward those with distinctive styling, presumably to convey to others their “green” intentions. And that — perhaps as much as aerodynamics — likely influenced the somewhat polarizing appearance of the original Leaf that debuted for the 2011 model year. But with progressively more all-electric competitors coming to the market, that “polarizing appearance” may have turned some prospective buyers toward other electric cars. So less-controversial styling is perhaps the most notable change to the second-generation Leaf, which goes on sale in late January. The greatest drawback to electric vehicles has long been their limited driving range between charges. But as originally predicted, advancements in battery technology have considerably improved range while driving down costs, and that combination stands as the second-most notable change reflected in the latest Leaf. Similar advances in technology have also made high-tech safety and convenience features more common in popularly priced cars, and those, too, are a major element of the redesign. Nissan styling cues carried into the Leaf’s redesign for 2018 include “boomerang” taillights and a floating rear roofline. While still distinctive, the overall look of the new Leaf is much more mainstream. While some cues were carried over – including the general shape – the controversial “Guppy” front end has given way to Nissan’s corporate V-Motion theme, and in back, boomerang taillights sit beneath a floating roofline, both likewise elements of the company’s latest styling trends. While the original Leaf’s 73-mile EPA range estimate was a landmark achievement in its day, even the 107-mile range offered on the latest “big battery” versions was falling short of that offered by current rivals. But instead of trying to leapfrog to the head of the class, Nissan instead chose to fill a range “gap” between the bulk of cars in the popularly priced EV market – which hover in the 110- to 125-mile arena – and the top-dog Chevrolet Bolt EV, which comes in at 238. As such, the 2018 Leaf has an estimated range of 150 miles, though Nissan says a version with a larger battery will later be made available that offers about 200 miles of range. Yet despite this greater range – and an increase in standard equipment – the base price of the Leaf has dropped by about $700 to $30,885 including destination. Among newly added standard features on the base S model are forward collision warning with automatic emergency braking and Leaf’s new e-Pedal driving mode. We found the latter to be really neat; it allows you to increase the regenerative braking effort to the point it essentially allows for one-pedal driving, as simply lifting off the throttle slows the vehicle enough that you rarely need to hit the brake pedal in normal driving. Options include a Level 3 quick-charge port with 120/240-volt charge cable and an All Weather Package with heated front seats/steering wheel/mirrors. Features added on the midline $33,385 SV include a Level 3 quick-charge port, 7-inch touchscreen, NissanConnect telematics with navigation system, and Apple CarPlay/Android Auto functionality. Optional are the All Weather Package along with a Technology Package, which includes 8-way power driver seat with lumbar adjustment, auto-dimming inside mirror, Homelink garage-door opener, 120/240-volt charge cable, blind-spot and rear-cross-traffic alert, automatic high beams, and pedestrian detection added to the automatic emergency braking system. Also available is “semi-autonomous” ProPilot Assist, which helps keep the Leaf in its lane and maintains a set following distance from the car ahead. Two really cool features of the new Leaf: The top-line SL’s 360-degree camera can be activated by pressing a handy button to the upper right of the touchscreen, and the standard “e-Pedal” switch can be used to increase regenerative braking to the point you rarely need to hit the brake pedal. The top-line $37,095 SL comes with most of those features plus leather upholstery and a 360-degree camera, with an optional Technology Package bringing the automatic emergency braking with pedestrian detection, automatic high beams, and ProPilot Assist. A notable part of the NissanConnect telematics system that’s standard on SV and SL is the ability to connect to your vehicle through your smartphone. This allows you to remotely check battery state-of-charge, lock and unlock the doors, turn on the heat, and find your car in a crowded parking lot. Although Nissan says it takes about 35 hours to fully recharge the Leaf’s 40 kilowatt-hour (kWh) battery off a Level 1 (120-volt) outlet, that time can be cut to about 7.5 hours on Level 2 (240-volt). And with the available 120/240-volt charging cable, you no longer need a “hard wired” Level 2 charger in your home; you can simply plug the cable into a 240-volt dryer outlet. On a Level 3 “fast charger,” Nissan says you can recover 88 miles of range in just 30 minutes. One element of the new design is a motor with 37 percent more power, now rated at 147 horsepower. It gives the Leaf a fairly strong full-throttle jump off the line along with decent passing power. And as in most electric vehicles, response to throttle inputs in virtually instantaneous, something that makes them especially well suited to slice-and-dice city driving. 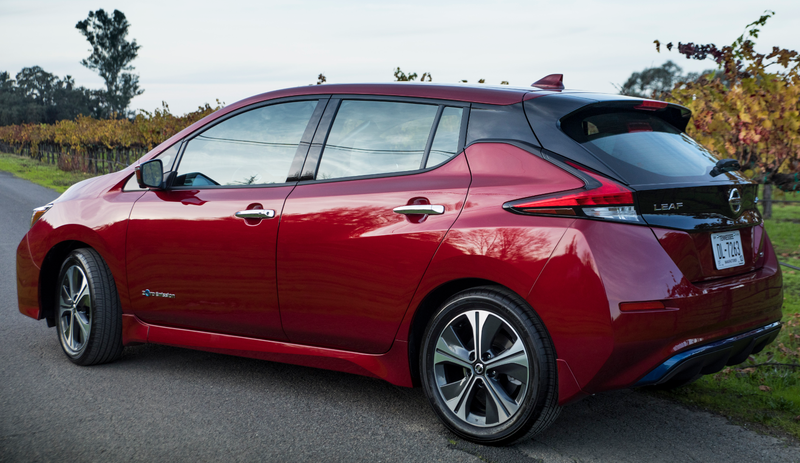 Ride quality is also good, as is handling, making the Leaf quite dynamically capable. Though most interior materials are hard plastic, the overall look (at least of the tested top-line SL) is one of techy elegance. Inside, thin padding covers the door tops and armrests, but hard plastic dominates. Fortunately, the two-tone color scheme of our test SL models combined with the gloss black and carbon-fiber-like trim to create a visibly pleasing environment. Interior storage is good rather than great, with a large (but inconveniently deep) glovebox, small console box, two console cupholders, a small forward console tray under 12-volt/Aux/USB plugs (oddly, only one USB), and door map pockets with cupholders. Visibility is somewhat restricted to the front and rear corners due to thick roof pillars, but it’s good to the sides. However, although the sunvisor extends when swung to the side, it still leaves the rear quarter of the side window uncovered. The base S doesn’t get a touchscreen, but it’s the only model to offer a CD player. On SV and SL, the infotainment system hosts a 7-inch touchscreen, volume and tuning knobs, and easy-to-reach virtual buttons that include numerous handy station pre-selects. Climate controls consist of repetitive-step pushbuttons for temperature/fan/mode, and while they’re not as convenient to use as rotary knobs, they’re easy to reach. Physical buttons activate the heated seats and steering wheel. The driver is afforded good headroom but rather limited legroom, and the steering wheel only tilts; it doesn’t telescope. In back, even 6-footers should find sufficient space, though legroom may get tight if the seat ahead is pushed far back. Although the Leaf’s cargo area is quite large, folding the rear seat backs results in a foot-high hump that limits what can be slid forward. The rear cargo area is fairly deep (with a 10-inch liftover) and large (Nissan claims a spacious 26.3 cubic feet). 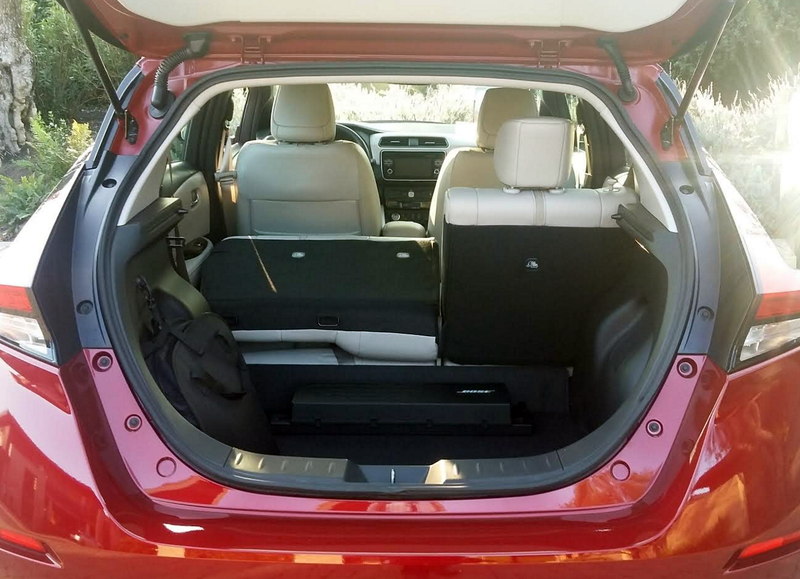 But though the rear seat backs fold to expand the area, they rest a good foot above the level of the cargo floor, so you can’t just slide large items forward. Although Nissan’s Leaf is far and away the most popular electric vehicle in the U.S. and probably the best known, it no longer has the “mainstream” segment virtually to itself. Numerous competitors have sprouted up in recent years, but most, including the Ford Focus Electric, Hyundai Ioniq Electric, Kia Soul EV, and Volkswagen e-Golf — share their bodies with gas or hybrid counterparts; only the Chevrolet Bolt and upcoming Tesla Model 3 have a distinct “electric-only” look like the Leaf. Of course, that’s not the Leaf’s only selling point, but it may be a requirement – and the most prominent 2018 improvement – for those who want their EV to stand out in a crowd. Leaf sits in what Nissan hopes is a price/driving-range sweet spot; a bit more of both than those of most mainstream rivals, with another version taking them up a step further due for 2019. Written by: Rick Cotta on December 19, 2017.on December 27, 2017.